The tree grows in the mountains and also in gardens and as a roadside tree. It grows to more than 30 meters in hight. Around May, the flowers like beautiful candles in white and pink begin to show. The fruit is almost round and falls down in late autumn. Sometimes the fruit is used to prepare a kind of flower, making bisquits and other food. To prepare the bitter fruit for human consumption, the poor mountain dwellers used a process that took quite some time to get the bitterness out of the fruit. Children use these fruits to make small toys, animals and so on.
. . . CLICK here for Photos : chestnut toys ! which has also been known as Hippocastanum vulgare (Gaertn. ), is an entirely different tree from the Sweet Chestnut, to which it is not even distantly related, and is of much more recent importation to English soil. It is a native of northern and central parts of Asia, from which it was introduced into England about the middle of the sixteenth century. 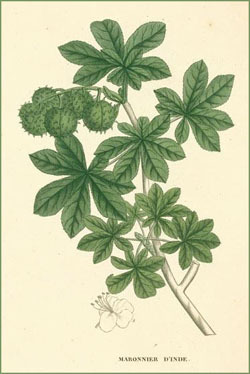 The name Aesculus (from esca, food) was applied originally to a species of oak, which according to Pliny, was highly prized for its acorns, but how it came to be transferred to the Horse Chestnut is very uncertain; perhaps, as Loudon suggests, it was given ironically, because its nuts bear a great resemblance, externally, to those of the Sweet Chestnut, but are unfit for food. Hippocastanum (the specific name of the common sort) is a translation of the common name, which was given - Evelyn tells us - 'from its curing horses brokenwinded and other cattle of coughs.' Some writers think that the prefix 'horse' is a corruption of the Welsh gwres, meaning hot, fierce, or pungent, e.g. 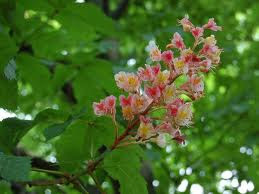 'Horse-chestnut' = the bitter chestnut, in opposition to the mild, sweet one. The bark and the fruit, from both of which a fluid extract is made. The bark is stripped in the spring and dried in the sun, or by slight artificial heat, and when dry, occurs in commerce in flattened pieces, 4 to 5 inches long and about 1 to 1 1/2 inch broad-about 1 to 1 1/4 inch thick, greyish-brown externally, showing corky elongated warts, and on the inner surface pinkish-brown, finely striated longitudinally. The bark is odourless, but has a bitter astringent taste. The bark has tonic, narcotic and febrifuge properties and is used in intermittent fevers, given in an infusion of 1 OZ. to the pint, in tablespoonful doses, three or four times daily. As an external application to ulcers, this infusion has also been used with success. The fruits have been employed in the treatment of rheumatism and neuralgia, and also in rectal complaints and for haemorrhoids. seem to provide kigo in both spring and autumn. In the spring time, the horse chestnuts' leaves are among the first to unfurl and grow green. They are followed by the beautiful flowers, perhaps the closest a flowering tree in Europe gets to the glory of the Kenyan / tropical trees. And in the autumn, there are the chestnuts themselves, growing on the trees, falling off, becoming playthings for the children -- and seeds for those who want to grow an easy and beautiful tree. of the floating world . . . The chestnuts of Kiso were famous. The poor farmers used to prepare the horse chestnuts in a way to make mochi ricecakes out of them to have some food in the winter months. This was also a souvenir at the time of Basho.
. Matsuo Basho Travelling . Issa might be talking about the sweet chestnut, see below. Even though cherry blossom is becoming part of the European spring, and is much loved here too, it will not in my lifetime reach European souls as Japanese cherry blossom reaches those of Japan. Japanese cherry petals and the Kenyan jacaranda petals, the chestnut petals too drop off the tree when still in perfect condition, and gather in drifts here and there, sometimes to be washed away by falling rain, like a tide of colour.